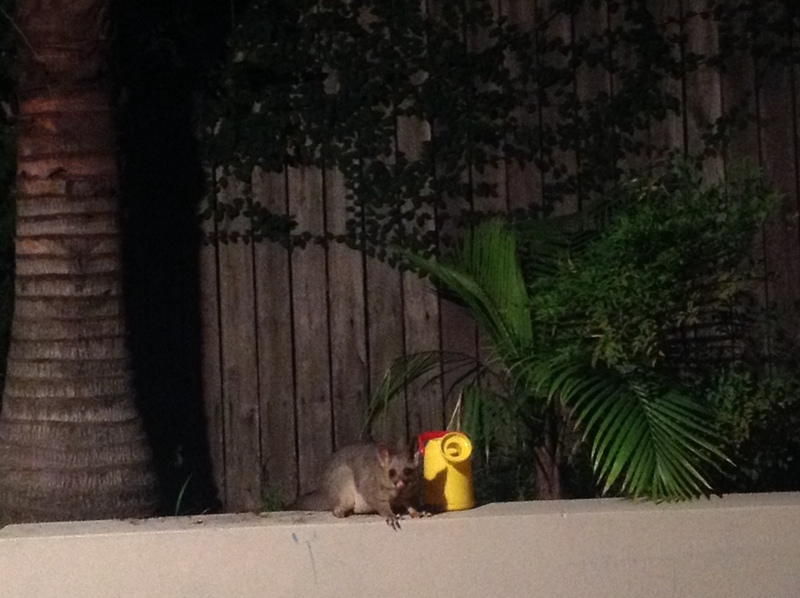 I have always heard possums out in our garden at night. Last year we managed to see one sitting on the fence but it was very dark. They run around in the garden making the strangest clicking, grunting, squeaking noises. Well, lately, as I have been trying to get our garden back into a tidy state, I have been finding so much possum poo…especially after we came back from our latest holiday. Tonight, as I was switching out lights downstairs I decided to click on the outside lights to see what I could see. Much to my surprise I had a visitor. Luckily my iPad was close for me to snap a couple of photos. It didn’t move one bit. We watched each other for a good five minutes before it dashed off into the trees. As I sit here now I can hear it out in the garden scratching around and rustling leaves.